It’s April and I’ve just come to the end of my second term at university! It seems to have flown by. Some news since my last post is that I’ve secured another internship at ScraperWiki for this summer! I’ll be looking forward to going back to work on more interesting problems and learn even more. Another bit of exciting news is that I recently bought a Mobius ActionCam to mount onto my quadcopter and hopefully get some good aerial footage! The Mobius is a fantastic camera, especially for its price. It costs around £50 and records 1080p HD video almost as well as the much more expensive GoPro cameras, which are normally used for this kind of aerial photography. 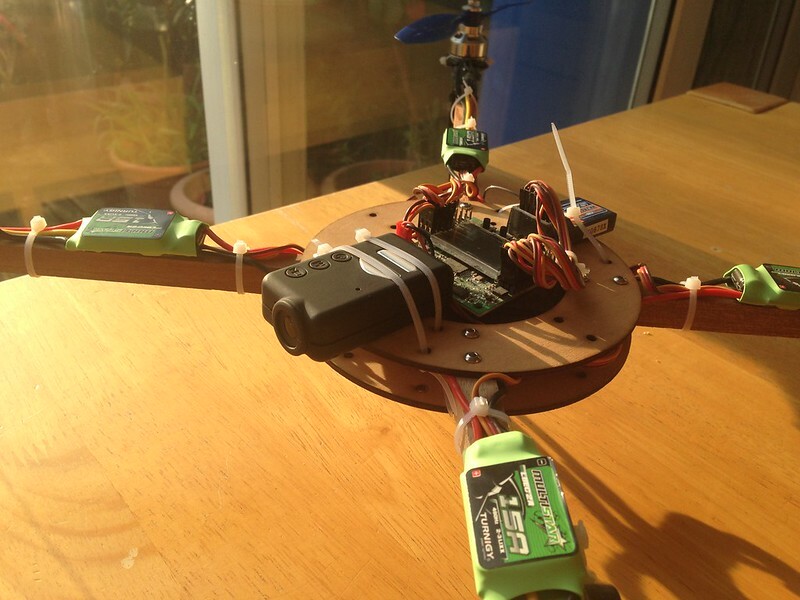 It’s also very compact and light, which makes mounting it on a quadcopter very easy. The Mobius ActionCam on my quadcopter. Since there’s only so much you can do when flying by line-of-sight, the next step would be to fit my quad with an FPV (First Person View) system to allow me to see what the camera is seeing and get much more interesting footage and to fly at higher altitudes. At the moment I’m hesitant, since FPV equipment isn’t cheap and a full setup would cost about as much as the quadcopter itself did, but I do plan to take the plunge eventually, and this kit from Ready Made RC looks promising for when I do. As of late I’ve also begun a deeper exploration into something which has interested me for a while: investment and the stock market. I’ve been playing around with technical analysis by paper trading on the demo platform offered by Trading212, which I’ll probably continue to do for a while before trying anything with real money. As well as this, I’ve been learning about derivatives by reading a book about options and futures. This break will be followed by a short summer term, then my exams, and that will be the end of my first year! It’s all gone incredibly quickly, and I’ll now be working hard towards my exams and will hopefully be able to get some good results and bring in a first for my first year. That’s it for now, my next blog post will be either after the exams, or hopefully before then!